Mother’s Day is on Sunday, May 12, which also happens to be the same day as graduation for many University of Illinois students. 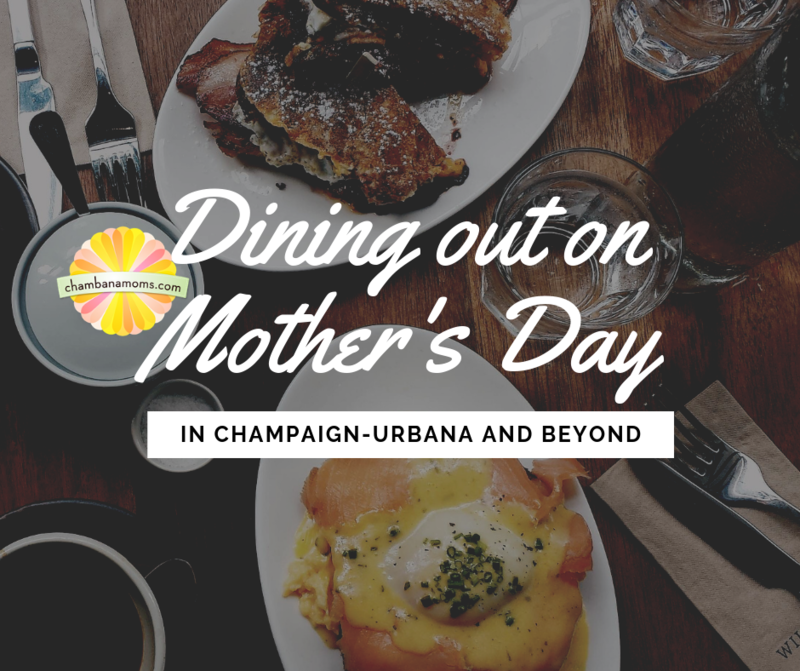 To say that Champaign-Urbana area restaurants will be busy on Mother’s Day (and weekend) is an understatement. Brunch will be served from 10 a.m. to 2 p.m. Check out the waffle bar, omelet bar, prime rib and/or ham carving stations, cocktails, Bloody Mary bar, and more. Reservations can be made online or by calling 217-239-9299. A brunch menu will be served on Mother’s Day from 10 a.m. to 2:30 p.m. Did we mention the bottomless mimosas? Reservations are definitely recommended. Call 217-239-3505 to get a table saved. Destihl, which normally serves brunch on the weekends, will be offering the same options on Mother’s Day from 10 a.m. to 2 p.m. Guests can order a la carte breakfast and lunch items off the menu. Walk-ins are welcome but reservations are also a good idea. Call 217-356-0301 to confirm a spot. Lodgic’s traditional Sunday brunch will be served from 10:30 a.m. – 2 p.m. Reservations can be made by calling 217-607-8126. Silvercreek will be offering a Mother’s Day brunch buffet from 9 a.m. to 4 p.m. Reservations are highly recommended and are limited at this time. Call 217-328-3402. Watson’s will be open and offering their traditional brunch menu for Mother’s Day. At this time, they do not take reservations. The Beef House in Covington, Ind., is located just past the Illinois/Indiana border (insider tip: don’t forget the time change — they are one hour ahead of us). It’s less than an hour’s drive from Champaign and worth the trip for their famous rolls, jam, apple butter, and of course, their steaks. Hours on Sundays are 11 a.m. to 9 p.m.; however, they are not taking reservations for Mother’s Day. See our review of the Beef House here. Firefly Grill in Effingham, which is about an hour and 15 minutes south of Champaign, has a garden on-site and is committed to buying locally to give its diners a complete farm-to-table experience. Situated next to a lake, Firefly Grill offers a great atmosphere as well as a delicious menu. Reservations are accepted by calling (217) 342-2002. Want to make a day of it exploring Effingham? We have a post for that. 3 Ravens in Monticello: Enjoy lunch, dinner or drinks at the family-owned, full service restaurant in downtown Monticello, which claims to feature the best selection of Irish Whiskey in downstate Illinois. Daily specials are listed on their website. Want more Monticello fun? We list Five Best Kept Secrets in Monticello. Bayern Stube in Gibson City is a unique, quaint restaurant in downtown Gibson City that serves authentic, German cuisine. Local favorites include schnitzels, sausages and strudels. You can’t go wrong with their beer selection either. Reservations are recommended. Hours on Sunday are 2-8 p.m. More fun in Gibson City? Check out our Harvest Moon Drive-In review. Epiphany Farms in Bloomington offers farm-to-table cooking and will be open on Mother’s Day from 7:30 a.m.-9 p.m. Reservations are encouraged by calling (309)-635-8707. Monarch Brewery in Monticello is offering a special Mother’s Day brunch from 9 a.m-2 p.m. offering food and craft cocktails. Reservations can be made by calling (217) 631-1141. JT Walker’s Restaurant & Brewery in downtown Mahomet is offering their traditional Sunday brunch on Mother’s Day from 11:00 a.m. – 2:00 p.m. Reservations can be made by calling (217) 586-1100.